You can transform any hoodie into the ultimate neck pillow! What's more annoying: Trying to sleep on a plane and waking up sore, shelling out a whopping $25 for a travel pillow in the airport or carrying said bulky pillow around in your suitcase for the length of your vacation? Well, you no longer have to decide between those terrible option since you can actually transform any hoodie into the ultimate neck pillow! 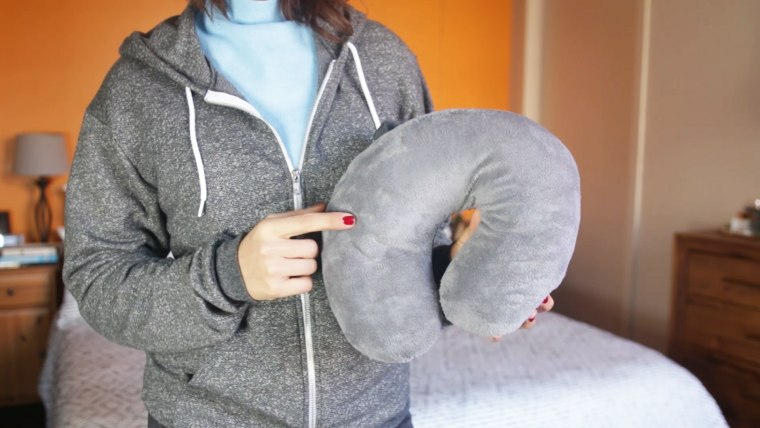 At TODAY Style, we love that once you de-plane, you can roll your pillow back into a sweatshirt that'll create less bulk and actually be useful on your trip. 1. Turn hoodie inside out. This step ensures you'll have it on the right side at the end. 2. Fold one sleeve over the front of the sweatshirt and one sleeve behind it. The sleeves will offer additional cushioning that will go around the entire circumference of the finished pillow. 3. Begin rolling the hoodie from the bottom so that the right side is facing out. Make sure to include the sleeves when you reach them, around mid-chest. 4. Pull the hood out from the center of the roll. Then, just slip it over your head! It's really that easy. Not only do you have comfort and softness around your entire head, but you can also pull the hood over your face in the event of a chatty Kathy sitting to your right. Now you'll travel light and sleep tight!